Mules hauling bags along the Bright Angel Trail. 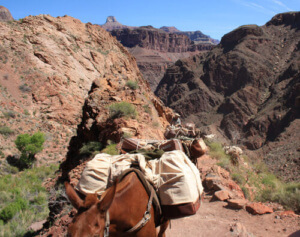 Guests hiking into the canyon may have the luxury of using Xanterra’s mule duffel service. Mules will carry your belongings in a duffel bag into the canyon for you while you hike the Bright Angel Trail. We cannot guarantee that every guest will have the opportunity to utilize this service as it does tend sell out up to a year in advance. If you’re interested we recommend calling Xanterra (888-297-2757) as soon as you book your river trip. Ultimately, you should be prepared to hike in all of your personal belongings loaded into your backpack for your river trip in case you aren’t able to book the mule service. Your guides will pick up each guest’s duffel bag from the mule wrangler about 2 miles upstream from Pipe Creek. This is where you will meet the boats and guides at the end of your hike in. It is extremely important that you follow these instructions when using the mule duffel service. This amenity is only available for guests hiking into the canyon. Outbound mule service does not work in conjunction with Grand Canyon Whitewater trips. You’ll need to arrive to the South Rim to drop off your bag at the Grand Canyon Mule Barn before 3:30 p.m. THE DAY BEFORE your hike into the Canyon. In case you will be late, there is a late drop-off option for an additional fee. Please make sure that you’ve attached the Grand Canyon Whitewater luggage tag that we will provide you with to your duffel bag. Each luggage tag should be clearly labeled with the guest’s name. PLEASE PLEASE PLEASE tell us in the office if you’re using this service either over the phone on your registration paperwork. We need to know exactly HOW MANY bags you’ll be muling in and WHO is using service. Our guides will be using this information on the river to collect the bags. DO NOT cancel or book muled bags within two weeks of your trip start date. If the mule service is sold out the day of your hike in, you cannot book for 2 days before due to exchange logistics. We cannot book the mule service for you. Please be sure you are well aware of the requirements of a Grand Canyon rafting trip regarding whether you’ll have to hike in or out of the Grand Canyon. Don’t count on the mule service to have a successful trip. Xanterra has the right to suspend services at any time if trail conditions are unsafe for the mules. Service Possible with Grand Canyon Whitewater vacations? *Mules CAN ONLY carry you in or out of the canyon if you book the entire mule train. This means you pay for 5 mules at a cost of about $900. For more information, give GCW a call at 800-343-3121. If you aren’t looking forward to hiking into or out of the Grand Canyon, but do want to raft…make sure to check out our Full Canyon adventures, on either motorized or oar-powered rafts.